Blogging regularly builds a personal relationship between your brand and audience and it makes you way easier to find online. It is an essential element of digital marketing—and one of the most effective ways of building a pipeline. The question is, how to keep blogging without losing your stride—or your vision. Our tried and true philosophy is to lean on editorial calendars to stay organized. A well-organized editorial calendar—or as we like to call them, ed-cals—will keep your strategy in check, and your content manageable. 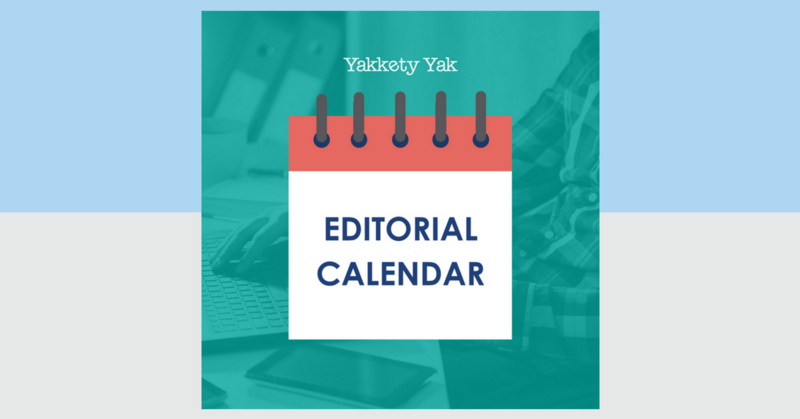 While we aren’t going to give away all of our secrets here (come on, we just met), we will shine a little light on how to get started on building a solid editorial calendar. The first step to a solid editorial calendar is to determine the overarching, raw, honest goal of your communication. Think about what you want your content to accomplish, from building an audience to increasing your revenue, attracting new customers and beyond. Having a clear vision of the direction of your business is an essential piece of content development, since every piece of content should be dedicated to reaching your overarching goal. Every business is multifaceted, which is why content buckets are such an essential piece of the content puzzle. Break down your goals into four to five key focal points. Whether this is a subset of an existing audience, or a specific service you want to flaunt, content buckets are the main pillars by which you will file your content. Why? Because it makes sure that each month, you are writing about the individual subsets of your company. Once your buckets are set, you can organize your content ideas accordingly. See below for an example. All of your content ideas should fall into a ‘bucket’, so you know exactly what purpose they serve. As you populate the calendar, think about blog topics that you can file underneath each content bucket. Consider adding diverse topic ideas that fall within your expertise, so that each week when you publish a blog post, you are adding something new and interesting to your site. These topics should be specific enough to stay on target for 400-600 words. If you try to tackle too much in one post, it will easily get off track. Once your editorial calendar is populated, it’s time to start writing. 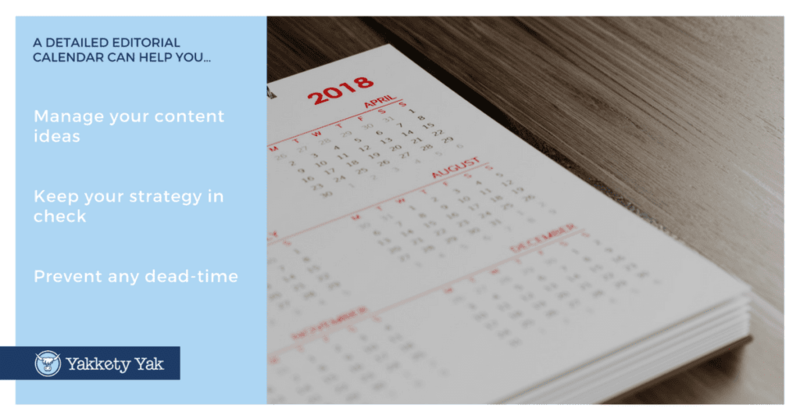 We recommend writing in batches so that you can schedule your content for the month in advance. There is nothing worse for writer’s block than a deadline you can’t meet. Setting up an editorial calendar can be time-consuming, but believe us when we tell you it’s worth it – it’s a content game changer. If you need some help setting one up, or if you just want to talk through some bucket ideas, give us a shout. We’d love to get you started. Like our post? Take it with you, and follow us on Pinterest to stay up to date on all our tips and tricks!